Emotions punctuate almost all significant events in our lives, but their nature, causes, and consequences are among the least well understood aspects of human experience. It is easier to express emotions than to describe them and even harder to analyse and explain them. Despite their apparent familiarity, emotions are an extremely subtle and complex topic. Unfortunately, the topic was neglected by philosophers and scientists in the past. In recent decades, however, interest in the emotions has grown considerably among scholars and students from many disciplines, as well as among the public at large. If there is to be any progress in this theoretically and practically important field, not only is a broad philosophical examination of basic concepts and issues essential (drawing both on analytical philosophy and phenomenology), but also an interdisciplinary approach that combines philosophical analysis with other types of scientific research (such as psychology, anthropology, history, sociology, and brain sciences). The clarification of basic emotional concepts as well as the unification of linguistic usages across disciplines and natural languages are necessary for integrating the growing body of interdisciplinary emotional research (e.g., does the traditional German "Gefühl" correspond to "feeling" or to "emotion"? and what about "Stimmung"?). The contemporary philosophy of emotions is equipped for this integrative task. It can provide us with a better and more comprehensive picture of the nature of emotions. 1. Robert C. Solomon, ‘The philosophy of emotions’, in M. Lewis/J. M. Haviland-Jones/L. Feldman Barrett (eds. ), Handbook of emotions, (New York: Guilford, 2008), pp. 3-16. 2. Charles Taylor, ‘The concept of a person’, in Human agency and language, (Cambridge: Cambridge University Press, 1985), pp. 97-114. 3. Robert C. Roberts, ‘The sophistication of non-human emotion’, in R. W. Lurz (ed. ), The philosophy of animal minds, (Cambridge: Cambridge University Press, 2009), pp. 218-236. 4. Martha Nussbaum, ‘Emotions as judgments of value and importance’, in R. C. Solomon (ed. ), Thinking about feeling, (Oxford: Oxford University Press, 2004), pp. 183-199. 5. Robert M. Gordon, ‘Pivotal distinctions’, in The structure of emotions, (Cambridge: Cambridge University Press, 1987), pp. 21-44. 6. 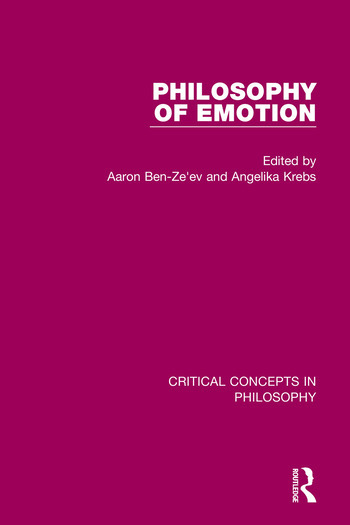 Aaron Ben-Ze'ev, ‘That thing called emotion: A subtle perspective’, (2017); revised version of ‘That thing called emotion: On the nature of emotional experiences’, in P. Goldie (ed. ), The Oxford handbook of philosophy of emotion, (Oxford: Oxford University Press, 2010), pp. 41-62. 7. Hermann Schmitz, ‘Emotions outside the box: The new phenomenology of feeling and corporeality’ (with an introduction by Rudolf Owen Müllan/Jan Slaby), Phenomenology and the Cognitive Sciences, 10, 2011, pp. 241-259. 8. Jesse Prinz, ‘Embodied emotions’, in R. C. Solomon (ed. ), Thinking about feeling, (Oxford: Oxford University Press, 2004), p. 44-58. 9. Bennett W. Helm, ‘Emotions as evaluative feelings’, Emotion Review, 1, 2009, pp. 248-255. 10. Nico H. Frijda, ‘The laws of emotion’, American Psychologist, 43, 1988, pp. 349-358. 11 Keith Oatley, ‘Two movements in emotions: Communication and reflection’, Emotion Review, 2, 2010, pp. 29-35. 12. Ludwig Wittgenstein, ‘Paragraphs 464-512 from Zettel’, edited by G. E. M. Anscombe and G. H. von Wright, (Oxford: Basil Blackwell, 1981), pp. 82-89. 13. Jean-Paul Sartre, ‘Outline of a phenomenological theory’ (and the conclusion) from Sketch for a theory of emotions, (London: Routledge, 2002), pp. 34-64. 14. Ronald De Sousa, ‘Truth, authenticity, and rationality’, dialectica, 61, 2007, pp. 323-345. 15. Patricia S. Greenspan, ‘A case of mixed feelings: Ambivalence and the logic of emotion’, in A. Oksenberg Rorty (ed. ), Explaining emotions, (Berkeley: University of California Press, 1980), pp. 223-250. 16. Christine Tappolet, ‘Emotions, perceptions, and emotional illusions’, in C. Calabi (ed. ), Perceptual illusions, (Basingstoke: Palgrave-Macmillan, 2012), pp. 205-222. 17. Mihaly Csikszentmihalyi, ‘Enjoyment and the quality of life’, in Flow, (New York: Harper & Row, 1990), pp. 43-70, 250-256. 18. Friedrich Kambartel, ‘On calmness: Dealing rationally with what is beyond our control’, translated for this edition with the author’s approval by Angelika Krebs, Anthony Mahler and Stephan Meyer from the German original ‘Über die Gelassenheit. Zum vernünftigen Umgang mit dem Unverfügbaren’, in F. Kambartel, Philosophie der humanen Welt, (Frankfurt am Main: Suhrkamp, 1989), pp. 90-99. 19. Hans Julius Schneider, ‘William James and Ludwig Wittgenstein: A philosophical approach to spirituality’, in J. Moore/C. Purton (eds. ), Spirituality and counseling, (Ross-on-Wye: PCCS Books, 2006), pp. 50-64. 20. Harry G. Frankfurt, ‘Autonomy, necessity, and love’, in Necessity, volition, and love, (Cambridge: Cambridge University Press, 1999), pp. 129-141. 21. Nancy Sherman, ‘The virtues of common pursuit’, Philosophy and Phenomenological Research, 53, 1993, pp. 277-299. 22. Peter Goldie, ‘How we think of others’ emotions’, Mind and Language, 14, 1999, pp. 394-423. 23. Margaret Gilbert, ‘How we feel: Understanding everyday collective emotion ascription’, in C. von Scheve/M. Salmela (eds. ), Collective emotions, (Oxford: Oxford University Press, 2014), pp. 17-31. 24. James J. Gross/Ross A. Thompson, ‘Emotion regulation: Conceptual foundations’, in J. J. Gross (ed. ), Handbook of emotion regulation, (New York: Guilford, 2007), pp. 3-24. 25. Arlie Russell Hochschild, ‘Exploring the managed heart’, in The managed heart, (Berkeley: University of California Press, 1983), pp. 3-23, 243-245. 26. Helmuth Plessner, ‘The source of laughing and crying’, in Laughing and crying: A study of the limits of human behavior, (Evanston: Northwestern University Press, 1970), pp. 138-157, 164-168. 27. Iris Marion Young, ‘Throwing like a girl: A phenomenology of feminine body comportment motility and spatiality’, Human Studies, 3, 1980, pp. 137-156. 28. Eugene T. Gendlin, ‘The wider role of bodily sense in thought and language’, in M. Sheets-Johnstone (ed. ), Giving the body its due, (Albany: SUNY Press, 1992), pp. 192-207. 29. Otto Friedrich Bollnow, ‘The nature of Stimmungen’, translated for this edition by Jochen Koenigsmann, Anthony Mahler, Stephan Meyer and Jan Müller from the German original ‚Der Begriff der Stimmung’, ‚Die Stimmungen als tragender Grund der Seele’, in O. F. Bollnow, Das Wesen der Stimmungen, (Frankfurt am Main: Vittorio Klostermann, 1956), pp. 33-65, 256-259. 30. Matthew Ratcliffe, ‘The feeling of being’, Journal of Consciousness Studies, 12, 2005, pp. 45-63. 31. P. F. Strawson, ‘Freedom and resentment’, in Freedom and resentment and other essays, (London: Routledge, 2008), pp. 1-28. 32. Bernard Williams, ‘Morality and the emotions’, in Problems of the self, (Cambridge: Cambridge University Press, 2009), pp. 207-229. 33. Jonathan Bennett, ‘The conscience of Huckleberry Finn’, Philosophy, 49, 1974, pp. 123-134. 34. Stephen Toulmin, ‘The tyranny of principles’, The Hastings Center Report, 11, 1981, pp. 31-39. 35. Richard Rorty, ‘Human rights, rationality, and sentimentality’, in Truth and progress, (Cambridge: Cambridge University Press, 1998), pp. 167-185. 36. Gilead Bar-Elli/David Heyd, ‘Can revenge be just or otherwise justified?’, Theoria, 52, 1986, pp. 68-86. 37. Avishai Margalit, (unpublished) ‘Forgiveness: Overcoming justified resentment’, (2017). 38. Michael Tanner, ‘Sentimentality’, Proceedings of the Aristotelian Society, 77, 1977, pp. 127-147. 39. Jerrold Levinson, ‘Emotion in response to art’, in Contemplating art, (Oxford: Oxford University Press, 2006), pp. 38-55. 40. Roger Scruton, ‘Content’, in The aesthetics of music, (Oxford: Oxford University Press, 1997), pp. 343-368. 41. Richard Wollheim, ‘Correspondence, projective properties, and expression in the arts’, in The mind and its depths, (Cambridge, Massachusetts: Harvard University Press, 1993), pp. 144-158, 203-204. 42. Jenefer Robinson, ‘On being moved by architecture’, Journal of Aesthetics and Art Criticism, 70, 2012, pp. 337-353. 43. Angelika Krebs, (unpublished) ‘‘As if the earth has long stopped speaking to us’: Resonance with nature and its loss’, (2017). 44. Tom Cochrane, ‘The emotional experience of the sublime’, Canadian Journal of Philosophy, 42, 2012, pp. 125-148. 45. Jonathan Lear,　‘Catharsis’, in Open minded: Working out the logic of the soul, (Cambridge, Massachusetts: Harvard University Press, 1998), pp. 191-218, 321-328. 46. Stanley Cavell, ‘The avoidance of love: A reading of King Lear’ (the abdication scene), in Must we mean what we say? (Cambridge: Cambridge University Press, 1969), pp. 285-293. 47. Michael Haneke, ‘Violence and the media’, in R. Grundmann (ed. ), A companion to Michael Haneke, (Chichester: Wiley-Blackwell, 2010), pp. 575-579. 48. Robert Nozick, ‘Love’s bond’, in The examined life, (New York: Simon and Schuster, 1989), pp. 68-86. 49. Emmanuel Lévinas, ‘The ambiguity of love’, ‘Phenomenology of eros’, in Totality and infinity, (The Hague: Martinus Nijhoff Publishers, 1979), pp. 254-266. 50. Fiona Ellis, ‘Insatiable Desire’, Philosophy, 88, 2013, pp. 243-265. 51. William Deresiewicz, ‘Faux friendship’, The Chronicle of Higher Education, 6, 2009, pp. 1-9. 52. Victoria McGeer, ‘The art of good hope’, Annals of the American Academy of Political and Social Science, 592, 2004, pp. 100-127. 53. Karen Jones, ‘Trust as an affective attitude’, Ethics, 107, 1996, pp. 4-25. 54. Gabriele Taylor, ‘Pride and humility’ (sections 1-3), in Pride, shame, and guilt, (Oxford: Clarendon Press, 1985), pp. 17-43. 55. Claudia Card, ‘Gratitude and obligation’, American Philosophical Quarterly, 25, 1988, pp. 115-127. 56. Andreas Dorschel, ‘Polemics and schadenfreude’ (2017); revised version of ‘Passions of the intellect: A study of polemics’, Philosophy, 90, 2015, pp. 679-684. 57. Aurel Kolnai, ‘The standard modes of aversion: Fear, disgust and hatred’, Mind, 107, 1998, pp. 581-595. 58. Amélie Oksenberg Rorty, ‘Fearing death’, Philosophy, 58, 1983, pp. 175-188. 59. Jon Elster, ‘Envy in social life’ (the first half of the article), in Alchemies of the mind, (Cambridge: Cambridge University Press, 1999), pp. 164-179. 60. Daniel M. Farrell, ‘Jealousy’, (2017); revised version of ‘Jealousy’, Philosophical Review, 89, 1980, pp. 527-559. 61. Alexander and Margarete Mitscherlich, ‘The inability to mourn’ (sections 3, 8 and 9), in The inability to mourn: Principles of collective behavior, (New York: Grove Press, 1967), pp. 25-31, 56-67. 62. Marcia Baron, ‘Remorse and agent-regret’, Midwest Studies in Philosophy, 13, 1988, pp. 259-281. 63. Jean Améry, ‘How much home does a person need?’, in At the mind's limits, (Bloomington: Indiana University Press, 1980), pp. 41-61. 64. Jerome Neu, ‘Boring from within: Endogenous versus reactive boredom’, in A tear is an intellectual thing, (Oxford: Oxford University Press, 2000), pp. 95-107, 298-299.